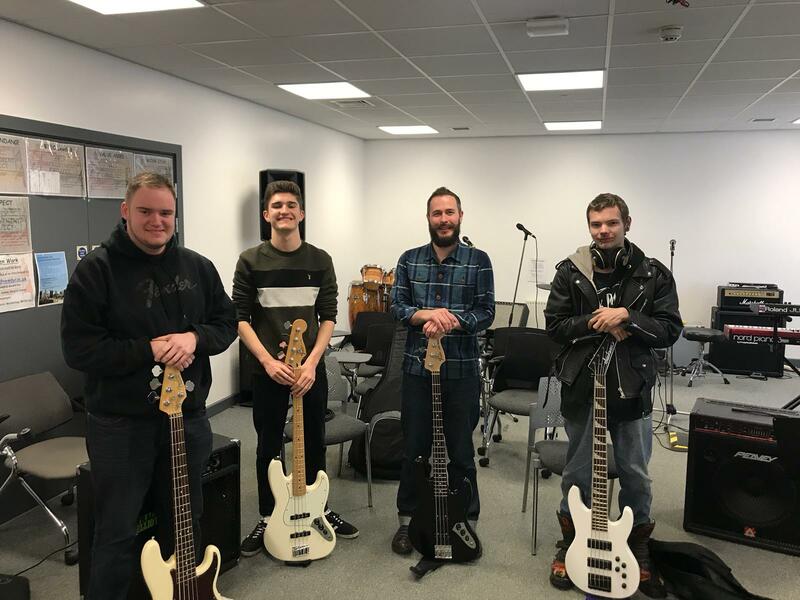 It was absolutely great to spend a few hours with three of the bass players on the Roots and Popular Music degree @ Durham New College. We talked about practice routines, transcription and looked at how to get the most out of any transcription that you do. Not just learning the line, but understanding it and trying to get inside the head of the bass player who wrote it. The students were great to work with and played some great ideas throughout the session – looking forward to seeing what they get up to in the coming years! It’s been a while I know…..but here’s an old transcription that I dug out and finished off. It’s the track that really got me started exploring synth bass lines on the electric bass and ‘thinking like a keyboard player thinking like a bass player…!”. Some great lines in the chorus. Enjoy! Action Research – end of the first year! Just come to the end of the first year of my action research project using online practise diaries with my degree students. It’s been a great year, they’ve all engaged with the idea really well (some have even modified the diaries in really innovative ways) and all have made some really fantastic progress. Now I’ve got 60 mins of interview / discussion to wade through so I can start writing up my research paper. Very pleased that the debut album ‘Inver’ by atmospheric-folk trio HAV has been released on Folkwit Records. It’s been three years in the making so it’s great that it’s finally seeing the light! It’s had some great reviews so far including: ‘(a) profoundly moving and expressive album that is the perfect antidote to quick fixes and empty gestures’ (FRUK); ‘mellifluous, immersive and gentle’(NARC); ‘beautiful‘ (The Crack) & a five star review from Rock ‘n’ Reel who say “Inver might just be the most inspired folk offering you’ll hear in the next twelve months”. Check it out here or on Spotify and let us know what you think! Posted in Music	| Tagged Cod-reggae, transcriptions, using a plectrum!! This new video by HAV has just been put out ahead of their forthcoming first studio album “Inver’ which is released on May 2nd 2017 on Fokwit Records. Whilst you wait for the album to drop this video gives you a little taste of some of this new material – a nice mix of folk tunes mixed with ‘found-sound’ and electonica – very atmospheric! I’m looking forward to firing up all my basses (upright, electric, ukelele) for the album launch at the end of May! The new record by Marcella O’Sullivan is out. It is called ‘Wood of the Pilgrims’ and I’m very pleased to have been able to contribute bass to two tracks. Featuring Marcella (of course!) alongside Christophe, Harry, Adam Downey and Adam Sinclair of the Rubber Wellies among others. Here’s the opening track for you to listen to right now. If you like it check out the album and drop Marcella a message – I know she’d be thrilled to hear from you. Enjoy! Been really enjoying learning this solo over the last couple of weeks. It’s a great example of a spacious, groovy and tasteful bass solo by one of the masters of the instrument! Head over to the solo transcriptions page to check it out. New Joy Atlas single ‘Altitude’ premiered! ‘Altitude’ the new single by Joy Atlas has been premiered on the ‘Line of Best Fit’ blog. Check it out!